The fall of the Iranian rial: too much of a good thing? In Tehran’s volatile currency market the rial fell to its lowest level ever today (January 2, 2012), the US dollar closing above 17,000 rials. The devaluation of the rial that started at a gradual pace over a year ago, and was largely expected and welcomed by economists, accelerated, going from less than 11,000 to around 15,000 rial per dollar in a matter of weeks. The additional fall in rial of about 10% in the last two days raises the question if the correction has gone too far. To answer this question one needs to have some idea of what is the right rate of exchange for Iran’s currency, something that you are unlikely to find in standard economics textbooks. There are two reasons why the market clearing price is not a good guide to the value of the rial: sanctions and oil. Financial sanctions against Iran, which intensified this week with the signing into law of the latest bill by President Obama extending them to transactions with Iran’s Central Bank, essentially create a segmented market for foreign exchange in Iran. One market is for foreign currencies held in various accounts belonging to Iranian banks, and the other is for foreign currency notes or paper money. Because of the sanctions, there is demand for paper money for certain transactions for which dollars or euros in foreign banks are of little use. Iran has reportedly about $80 billion in bank accounts around the world, which it cannot easily spend. So, for most transactions people are forced to buy paper currency in the Tehran market, or buy it in Dubai and have it shipped in. For example, to send money to your daughter in Malaysia, these days you have to find a trustworthy traveler to take it for you because the Central Bank cannot make the transfer. So much for smart sanctions. This market is relatively small, however, so its price can fluctuate rapidly. Some of the increase in the value of foreign currencies reported in recent weeks is probably of this kind, reflecting the tightening of sanctions. As more people in need of dollars enter this market — manufacturers in need of imported parts, parents needing to send money to their children studying abroad — the price can shoot up quickly. So, the two-tier exchange rate system that has recently emerged is in part the result of sanctions, not Iranian government policy. It is therefore not to be confused with the policy-induced multiple exchange rate system that existed before 2000-2001. At least a part of the current gap between the official and the free market rate is because there are two types of foreign currencies, paper money and electronic bank accounts. The government has little control over this gap, unless it can find a way to bypass the sanctions and enable Iranian importers to use its holdings of foreign currency. We do not know what the equilibrium exchange would be if sanctions did not exist because we do not know the size of the market for paper currency. The second reason why it is difficult to determine the right exchange rate lies at the heart of Iran’s oil-based economy. Roughly speaking, and ignoring capital accounts, in a normal economy the exchange rate reflects two productivities, the productivity of workers producing for exports at home relative to the productivity of workers in countries from which imports originate. Since in a balanced economy productivity in the export sector is close to the average level of productivity in the economy, the exchange rate reflects relative productivity levels in the two countries. So, if in one country demand for imported goods expands in line with increase in productivity, its currency need not depreciate; higher productivity would help pay for the additional imports because it would make the country’s exports more competitive. But if exports are mostly oil or oil related products, this mechanism would fail to work. (Iran’s non-oil related exports amount to less than 5% of total exports.) The oil sector produces a lot of value with relatively few workers, as if these workers were much more productive than their fellow workers in the rest of the economy. But “productivity” in the oil and oil-related sectors such as petrochemical depends on the price of oil and on how much the government decides to extract from its reserves, two variables that have nothing to do with average productivity. The world price of oil is beyond government’s control, but how much it decides to extract (or more precisely how much of its oil revenues it decides to inject into the economy) does affect the exchange rate. The fact that governments of oil-exporting countries can influence the equilibrium exchange rate by merely selling more oil suggests that the textbook case of supply and demand is not all that relevant. The market for foreign exchange is dominated by a monopolist –the government — which has to decide on its oil exports and the exchange rate simultanously. I do not know how one would go about finding the optimal level at which the government should set the exchange rate (by extracting more or less oil or by brining more or less of the oil money into the economy). But I do not need to know the optimal rate to know that, until a few weeks ago, Iran’s currency was highly overvalued. The oil boom of the last decade that brought $80-$100 billions a year in oil revenues prevented the rial from falling in value despite rising inflation in Iran. As a result, imports became increasingly cheap, undermining domestic production. The figure below shows that while Iran’s price level was rising fast (the line in green) its exchange rate remained rather steady (red), causing the real effective exchange rate (EER, in blue) to increase; that is, Iran’s currency appreciated relative to the currencies of its main trading partners. 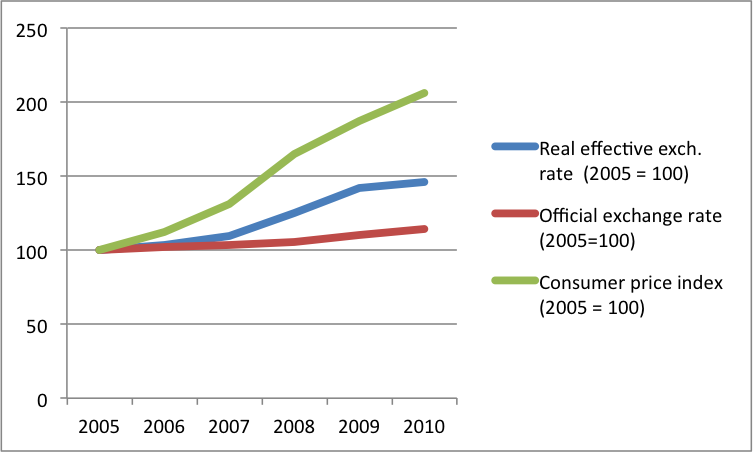 Iran’s consumer price index more than doubled during 2005-2010 while the rial lost less than 15% of its value, causing the EER to increase by 50%. If we take these numbers as our main guide for deciding how far is too far for the rial to fall, 50% would be about right. This simple analysis then suggests a band between 15,000-16,000 rials per dollar. This adjustment is long overdue and the impact of the real appreciation of the rial on the real economy has been quite severe. Because Iran’s economy is rigid and workers move slowly between sectors, the shock to the tradable sectors has caused loss of output and increased unemployment in tradable sectors, such as textiles. If the oil boom hurt Iran’s tradable sectors, can sanctions do the opposite by protecting domestic production from foreign competition? The answer is yes and no. Yes, because as Iran finds it increasingly difficult to pay for imports using its oil money deposited in foreign banks, and has to resort to barter and other special arrangements for tis import, domestic production will gain shelter from foreign competition. No, because much of domestic production depends on imports of intermediate goods, which will be also cut as a result of tougher trade conditions. The fall in rial is just one part of this process of adjustment. As it falls it sets both forces into motion: the good (more protection) and the bad (costly inputs for industry and agriculture). To answer the question that I posed at the outset for this post more accurately — has rial fallen too much? — requires knowing which of these two factors is stronger. Iranian Rials will soon become the hottest best-selling currency of year 2015 and likely to be for many years to come. Iranian Rial exchange rate was 1750 IRR to one USD in year 2001. It is now about 2980 Iranian Rials to one USD. USA Sanctions / Embargo against Iran will be lifted soon. Many countries have abolished the embargo which gives you a hint of the volume of Iran economy. So much expectations that Iranian Rial value will raise due to the lift of sanctions and the great potentiality of the Iranian economy. Firstly, I need to say that I am a huge fan of your weblog. You claimed that the Central Bank has little control over the supply of “paper” Dollars. But, according to the Central Bank’s 1388 Annual Review, due to the sanctions and the growing demand for paper currency for foreign transactions, more than 75% of the OVERALL interbank foreign exchange transactions in Iran are now done in the “secondary market”,which is an interbank market for PAPER currency. The report highlights that the Central Bank acts as the main supplier of the paper currency in this market. I would highly appreciate it if you could kindly respond to this point. Thank you for reading my weblog and for the link to the Central Bank Annual Review. I am not sure what the report means by “the secondary market”. It does not seem the same as the market for paper money. $38 billion would seem like a lot of money to haul around in paper! Your reference to this market as an interbank market also implies that it is not in paper money. That said, you are right, the Bank is the main supplier of paper money, at least until recently, but I do not know if they publish numbers for that. In any case, now this is limited to sales to travelers and those with official needs, like licensed importers. I still do not know where parents go to send money to their student children in, say, Malaysia? I doubt the Central Bank is selling paper money to them. should it be a common characteristic for strong economies to be able to shift workers between sectors? then what about the training and time/expenses businesses have to pay for that. Yes, advanced economies are more flexible, so their workers move between jobs and sectors more easily. In Iran movements between agriculture and other sectors is difficult, and in and out of the public is difficult, at least for older workers (some new government employees are hired in one year contracts). Thanks for the article. It’s good to see regular posts on this site again. What effect will the government’s banning of the unofficial exchange market have on the exchange rate? The rial is trading over 20,000 to the dollar now. Is this primarily because of the ban? From my understanding ordinary people have great trouble buying dollars from the governmental banks and can only do so for certain purposes. Thus they resort to the sarafs which sell dollars at the azad rate which is much higher than the official rate. To what extent can businesses trade at the official rate? The ban has the effect of sending some transactions underground, and further narrowing the small “curb” market for paper money. No, the high rate is not primarily because of the ban; it is because the government cannot provide enough paper money to the market, and probably should not. Iran is entering emergency conditions, people are hoarding foreign currency to protect their wealth or savings, some are taking money out of the country, and it is not the government’s job to provide the means for them to do so. I do not know who is getting foreign exchange at the official rate. Whoever they are, they will make easy money when they sell the goods they import (or sell their dollars!). Perhaps only government agencies are getting that at this point. If anyone can help me answer these questions I have about the following clashes, The Fall of Saigon, Iranian Hostage Crisis, Fall of the Berlin Wall, and the Gulf War? What type of government lead each of these? How was the U.S. involved, what was our role anyway? What was the outcome of each of these clashes, and did situations in these countries ever improve after? 1- Would the increased import costs due to depreciation of Rial as well as sanctions lead to increased capacity to manufacture intermediate goods or even capital goods necessary for increasing production? More broadly would it help Iran to develop a technological/ Scientific base no matter how rudimentary like when Soviets were cut off in early 1950’s? 2- Can Iran do away with the fiat currency and instead introduce a non-fiat one? For example by introducing a new rial which is directly linked to oil, a product Iran has plenty of? Let’s say Iran set the value of the new Rial at one liter of Iranian crude oil, payable to the bearer upon demand. Is there any way such a system could benefit Iran? Thank you! Yes, depreciation is a good for domestic production and can encourage investment and innovation, but how responsive production is to a price stimulus depends on other things. In this respect Iran’s economy has several limitations. First, exports of oil and oil related exports are naturally not price elastic, so we lose all the stimulus that other countries get in their export sector. Second, the business environment is not conducive to long-term investment. On the plus side, Iran has a good physical infrastructure, but then its internet network is just about the worst in the Middle East. I don’t think we should expect magic from the exchange rate. Productivity has to increase and that requires institutional reform. Not sure about the answer to your other question. I don’t see how a new currency can help. Thanks for the link to the TB article. The articles’s last point that the fall of rial has nothing to do with sanctions is hard to believe. Most people engaged in international trade in Iran will tell you that doing such transaction have become steadily more difficult in the last year or so because of the banking sanctions. The spectre of sanctions on the central bank may have easily created a rush to buy dollars now. Regarding its larger point about financing the budget, yes, the government benefits in the short run from selling its dollars at a higher rate, but will lose when prices increase later, so it would seem to me that devaluation as a way of closing the budget gap shortsighted, which does not rule it out! There is also the risk of jeopardizing the subsidy reform program, which the government has gambled on big time. This analysis is yet another conspiracy theory from Iran. It is unfortunate that this kind of stuff appears on a site associated with the PBS. But then this is the internet age and anyone can say what they want! fall in rial in this case causes both a fall in domestic product and a rise in price of intermediate goods. Markt instability is not good, but an overvalued exchange rate, even if stable, is bad. Yes, the price of intermediate goods increase but the protection from imports will outweigh this effect in the higher value-added sectors. I did not get why you’d chosen the interval 2005-2010? I mean why 2005 for the starting year? If we choose for example 2000 as the beginning of the interval we’ll end up in a significantly higher number compared to 50%. Actually, the real effective exchange rate did not increase between 2002 and 2005, mainly because the rial depreciated by nearly 30% during that period. Is there any potential for the costly inputs to be the driver for more of an internal production for at least some of the needed inputs/imports? Or is it that such capabilities to produce those needed imports simply does not exist? Sorry, I replied to your comments but seem to have posted it int he wrong place! The capabilities to import substitute for intermediate products exist but, as I noted to in my reply to another comments, I do not expect a big effect because the economic environment in Iran is not conducive to long-term investment at this time. Most policy makers thing the exchange rate should be brought back to the old level. The eight year war with Iraq apparently did encourage in import substation of this sort, though I have not read any definitive study about it. One should keep in mind also that international trade foster technological advance, so the closing of the Iranian economy, even if it encourages local production, will cost the country in terms of technological progress.